Despite the widely held belief that Canada is a benevolent international actor, Ottawa usually works to advance this country’s corporate and imperial interests. Torture in Afghanistan, saber rattling on Iran, Israel ‘right or wrong’ and opposition to climate negotiations, are high-profile recent examples that have challenged many people’s assumptions about Canada’s role in the world. There are many more, less publicized, recent examples of Canadian malfeasance. Over the past 125 years few countries have been more brutally exploited than the Congo. This history, however, does not trouble Ottawa. In mid November Canada opposed the country’s move to gain a greater share of its vast mineral wealth by obstructing international efforts to reschedule the country’s foreign debt, which was mostly accrued during more than three decades of Joseph Mobuto’s dictatorship and the subsequent war. Ottawa refused to respond directly to allegations that it used the Congo’s indebtedness to gain political concessions for Canadian mining companies. But, Canadian official Me’shel Gulliver Belanger told Reuters, “some Canadian firms have been having significant issues in a challenging investment environment.” After winning concessions that pleased Canada’s many miners in the Congo, Ottawa relented on the debt rescheduling. Home to Canada’s second most important foreign policy endeavor, Haiti is another country that has borne the brunt of Western, U.S.-led, imperialism over the past century. And Ottawa’s reaction to the terrible earthquake suggests we can expect more of the same. Initial search and rescue focused on places frequented by foreigners and the Haitian elite such as the UN compound and Hotel Montana. At the same time, rescue workers were dissuaded from entering the ‘dangerous’ slum neighbourhoods of Port-au-Prince. Overthrown in 2004 by the U.S./France/Canada, Haiti’s most popular political party, Fanmi Lavalas, was barred from participating in parliamentary elections scheduled for February 28 (they were canceled after the earthquake). Excluding the party supported by the country’s poor majority was deemed good for business, which is why Ottawa failed to mention the issue. (Montreal-based Gildan, the world’s largest blank t-shirt maker, is the second largest employer in the country while a number of Canadian mining companies are active there, including Eurasian Minerals which acquired prospecting licenses that cover approximately ten percent of Haiti’s land mass.) Instead of opposing Fanmi Lavalas’ exclusion, Foreign Affairs spokeswoman Catherine Loubier congratulated Haiti’s government for bringing “a period of stabilisation” good for “investment and trade.” Ottawa backed up its words with deeds, adding $15 million to a Haitian prison and police system that has been massively expanded and militarized since the February 2004 U.S./France/Canada coup. Haiti, the Congo and most other countries in the Global South have long complained about the power of international finance. As a means to regulate speculation in financial markets, in mid November U.K. Prime Minister Gordon Brown proposed a tiny (ranging from .005% to 1%) tax on international financial transactions. Worried about the plight of investment bankers Canadian Finance Minister Jim Flaherty immediately dismissed the idea of a global ‘Tobin Tax’. “That’s not something that we would want to do. We’re not in the business of raising taxes,” said Flaherty. At least Picolotti wasn’t murdered. On December 21 and 26 two activists opposed to a Vancouver-based Pacific Rim Mining project in El Salvador were killed (a third anti- mining organizer was murdered in June 2009). Instead of taking any responsibility for this violence, Pacific Rim went on the offensive. The company sued El Salvador for refusing to approve the mine’s permits. If decision makers cared about the social/ecological fallout caused by Canadian miners they would work to reign in these companies, rather than diligently defending their interests. 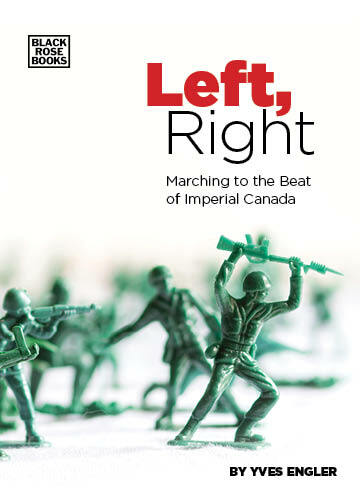 Unfortunately social justice, humanism and morality rarely motivate Canadian foreign policy. Instead, corporate and imperial interests dominate this country’s role in the world. It’s time to acknowledge this, which is the first step to changing it. This article first appeared in the May issue of Canadian Dimension magazine.